dedicated to the humble chickpea…. hummous….the Middle Eastern self starter…. May 13th is marked on the calendar as International Hummous Day, a whole day dedicated to the humble chickpea. A popular dip throughout Israel and the Middle East, hummous has recently been elevated to becoming one of Israel’s ‘national foods’, appearing on menus in restaurants and cafe’s throughout the country. Chickpeas are legumes and rich in nutrients. They are considered to be a popular source of vitamins and minerals in the diet of both vegetarians and vegans. It popularity follows the dietary laws of Kashrut and therefore hummous can be eaten with both meat and milk meals. Hummous is directly translated from the Arabic meaning ‘chickpeas’ a staple ingredient in Middle Eastern cuisine dating back to ancient times, although widely used in stews and tagines, rather than as a cold dip. Hummous in it’s simplest form is made from cooked, mashed chickpeas and combined with tahini, olive oil, lemon juice, crushed garlic and salt, however, many combinations of spices can be added for extra flavour with cumin, coriander or smoked paprika being the most popular and garnishes including whole chickpeas, pinenuts, flat leaf parsley or paprika. Other versions include using fava beans or broad beans instead of chickpeas and adding beetroot, green olives and sun-dried tomatoes for colour and texture. Sumac and za’atar are also used sprinkled on top to enhance the Middle Eastern flavour. Hummous is part of the culture of Israel and equally as popular amongst the Israeli Jews and Arabs alike. 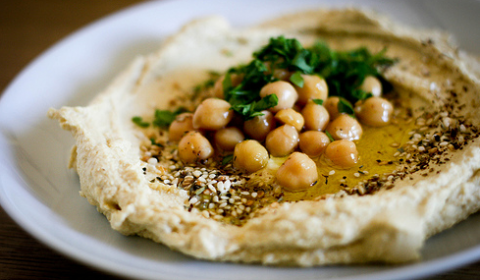 Throughout the country there are restaurants dedicated to the humble chickpea and even tours throughout Jerusalem and Tel Aviv to find the best tasting plates of hummous, made from traditional recipes handed down through the generations of the eclectic cuisines of Israel. Previous Post‘foodography’ the genre of food art…..